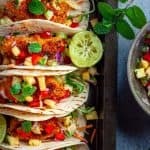 These Fish Tacos with Pineapple Salsa have a deliciously crispy crumb on the outside and big chunks of white fish on the inside. 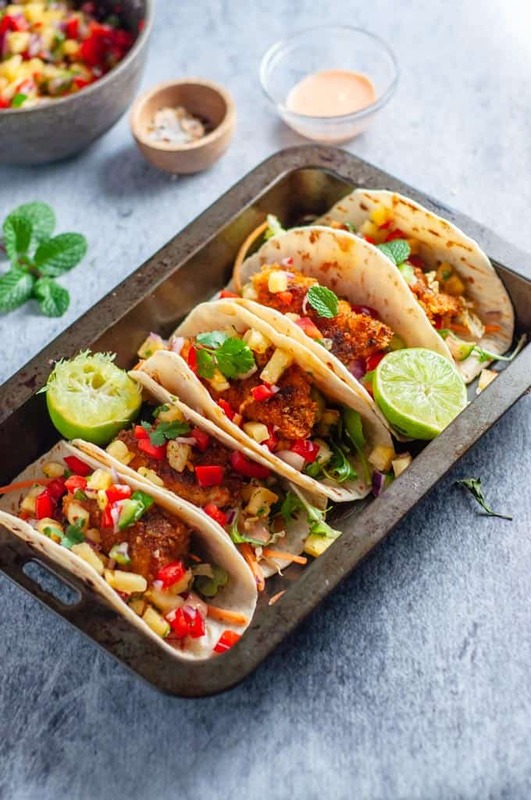 A little bit spicy from the combination of different herbs used to coat the fish, a little bit tangy from the pineapple, chilli, tomato and lime, and a whole lot of summer together in a lightly grilled soft mini taco. To make the perfect fish taco, you need to have the right kind of fish, which is a firm white fish. For this recipe I used snapper – a mild tasting meaty fish. Other types of fish that would work well would be Ling, Mahi Mahi and Cod. I used 500 grams (1 pound) of fish which was just the right side to feed four people with 2 or 3 tacos each. 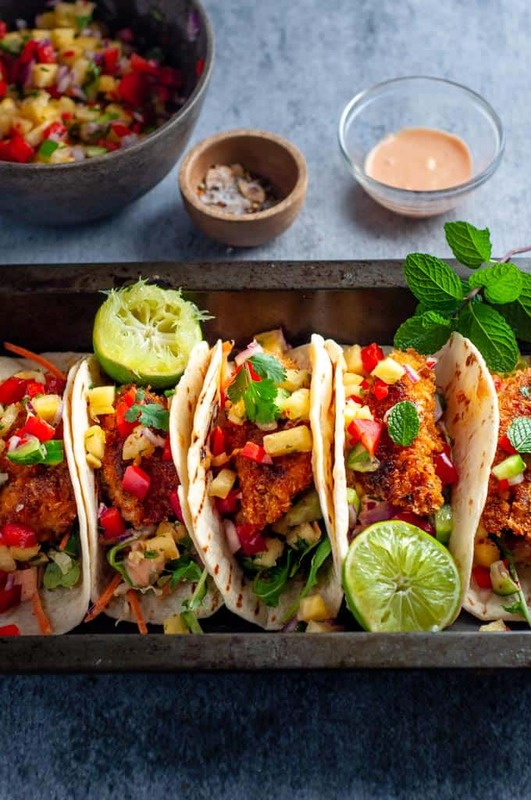 The thing that makes these Fish Tacos stand out is the special mix of herbs and spices to create that crispy and crunchy, sweet, salty and tangy flavour. I used a combination of 7 different dried herbs in different quantities: Smoked paprika, Hot Paprika, Sweet paprika, onion salt, Garlic salt, Thyme and Oregano. 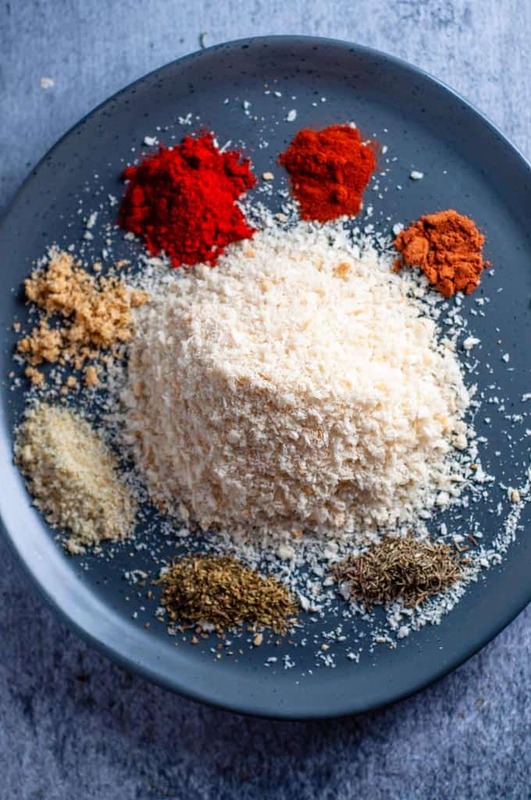 This was then mixed with Panko Breadcrumbs which is what really creates that crispy golden crumbed that fish tacos are known for. 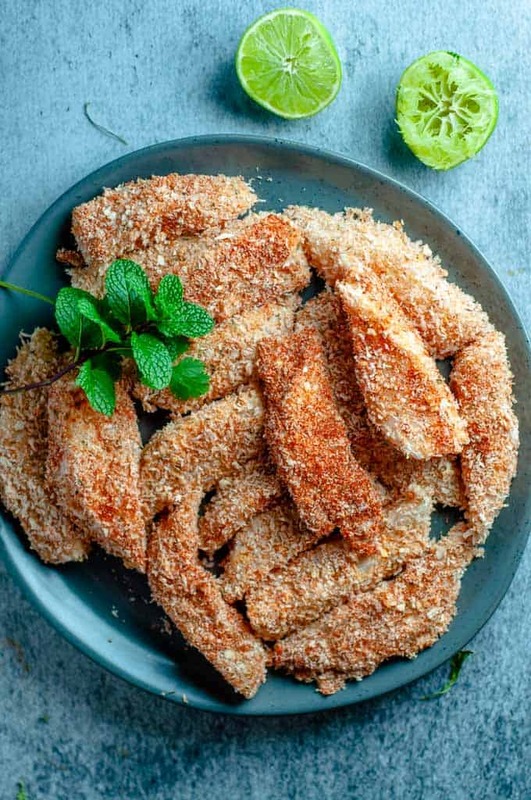 If you’re not familiar with Panko Breadcrumbs, they are Japanese breadcrumb, that is more course in texture than other breadcrumbs. They are readily available at mainstream supermarkets here in Australia in the Asian food aisle. 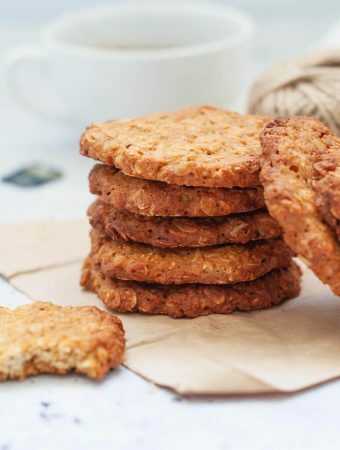 They are a great change from standard breadcrumbs if that is all you’ve ever used! 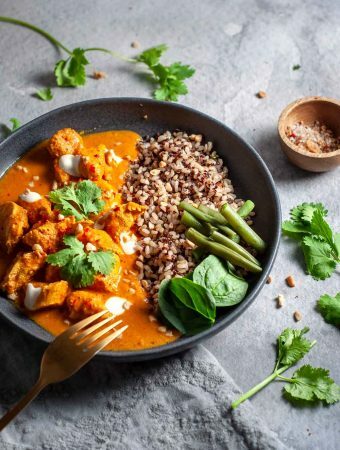 TIP: The spice mix I use in this recipe is also great for using as a rub on chicken, or for crumbing chicken, and as a seasoning in meatballs. Over the years my husband and I have eaten lots of fish tacos. At cafes, at markets and from food trucks at festivals! We just love them. So needless to say we have high standards when it comes to making them at home. Even after eating many dozens of fish tacos in the past, this was the first time I’d made them at home and they were a complete hit. 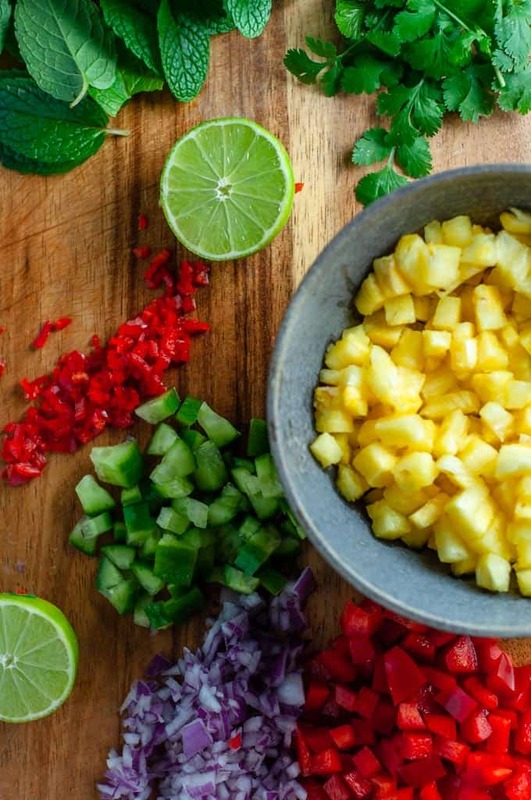 The perfect pineapple salsa needs a few things: pineapple obviously, but not the tinned stuff. You’d be doing yourself a disservice if you went to all this effort and used tinned pineapple. It just wouldn’t be the same. Instead, buy a fresh ripe pineapple and you’ll be amazed at the difference. 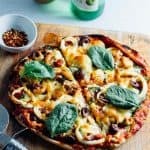 The other things you’ll need are capsicums or red peppers, red onion, coriander/cilantro, mint, fresh chilli, cucumber, limes, and salt and pepper. 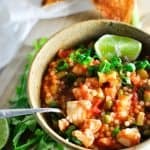 With these round up of ingredients you could already see what a colourful accompaniment this is to the crispy fish and soft taco. 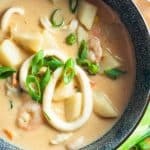 More Seafood Dinner Recipes — >>> Salmon Curry In A Hurry, Garlic Prawn and Tomato Risotto, Rich and Creamy Seafood Chowder and this Simple and a little Spicy Salmon Stirfry. You’ll need two things. Full fat mayonaise and Sriracha sauce. You’ll only need a little Sriracha sauce (unless you like it super hot). This is one of my secret go to’s to create a well rounded dish that has texture, crunch, sweetness, spiciness, saltiness, and softness. 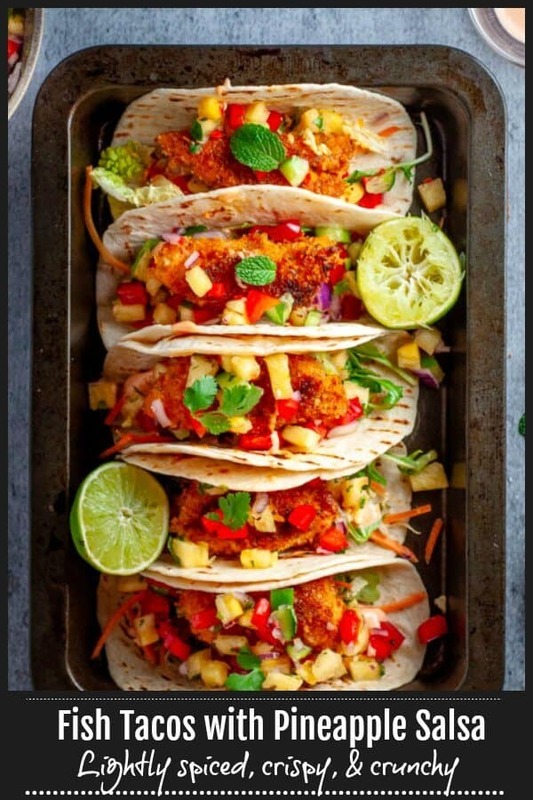 TIP: Heating a grill pan on the stove on the highest temperature (without oil) and placing the soft tacos one at a time for 10 to 15 seconds each side is highly recommended and really adds to the overall flavour. 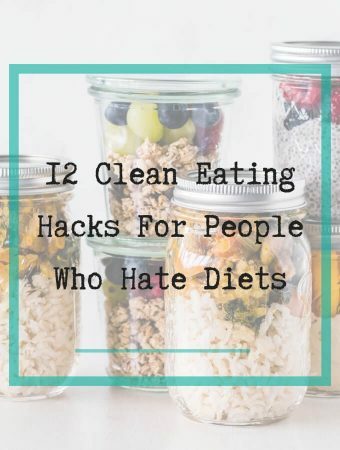 Eat and make another one! 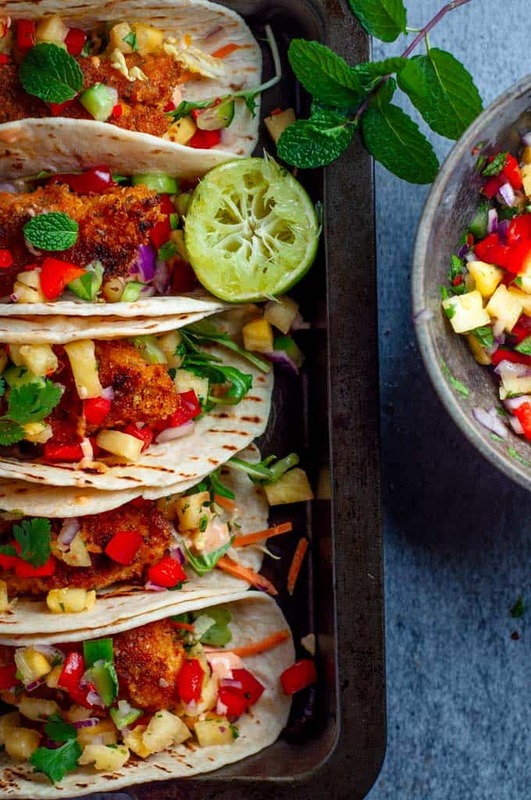 You won’t regret making these fish tacos with pineapple salsa. In fact you might just forget about all the other tacos you’ve ever eaten because these will become your new go to favourite as they have done in our household. Like what you see? 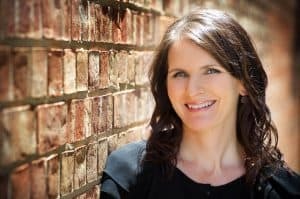 Follow me on Facebook or Pinterest! Did you try a recipe? 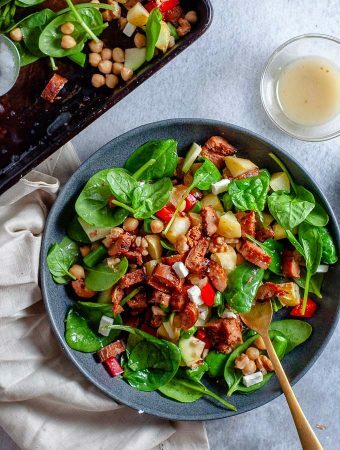 Tag me on Instagram: @mysugarfreekitchen, and leave a comment & star rating! 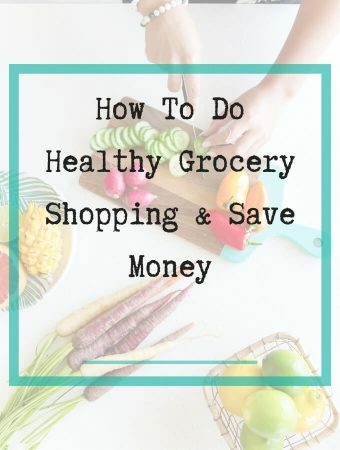 Can be pre made several hours ahead. Add all ingredients to a large mixing bowl and stir to combine. 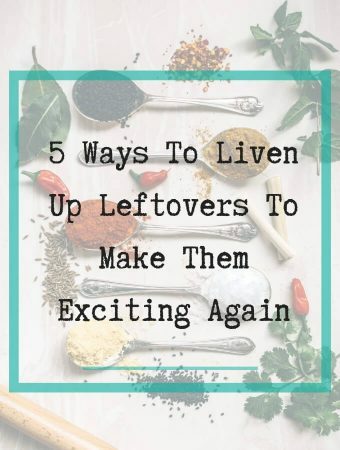 Cover with a lid or plastic wrap until ready to serve. Make sure to add salt and pepper to taste. Prepare 3 bowls. Add the plain flour to the first bowl. To the second bowl, add the egg and milk and whish until combined. To the third bowl add all the spices and panko breadcrumbs. Making sure your fish pieces are no more than 2cm wide in strips, take one piece at a time and dip in flour, shaking off excess. Next dip in the egg wash. Finally press firmly into the crumb mixture, turning and pressing firmly a few times to coat thoroughly. Place crumbed pieces onto a clean plate. Repeat process until all the fish has been crumbed. Cooking the fish: Heat a large pan with the olive oil on medium to high heat. Place the fish pieces into the pan for 3 to 4 minutes each side, or until golden brown. Once cooked, remove from heat and remove fish from pan. Optional – drain on kitchen paper/paper towel. In a small mixing bowl, place the mayonnaise and sirracha. Mix with a spoon until all combined. Heat a griddle pan on high and place one tortilla at a time for 30 to 40 seconds each side until the char marks appear and the tortilla is warm. Repeat for remaining tortillas. Grab a tortilla in one hand. Add some shredded cabbage and/or carrot. Add sauce. 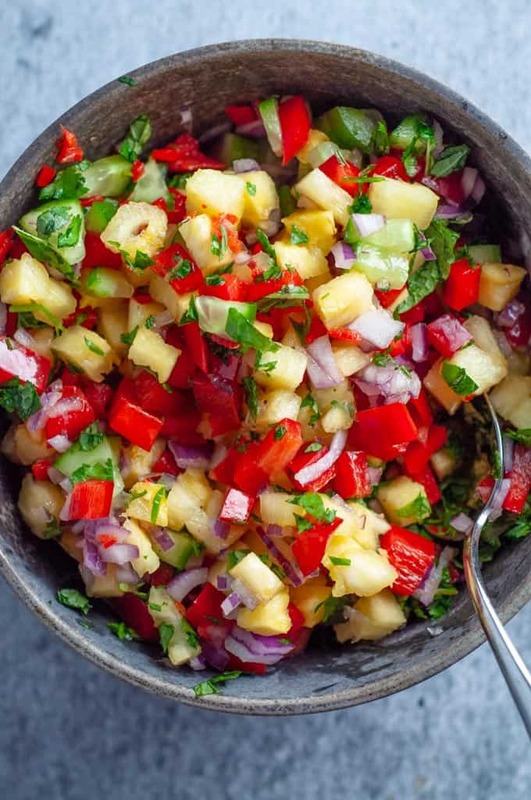 Add pineapple salsa. Add the fish. A little more salsa. Optional more sauce on top if you like. Add 1 tablespoon of siracha to the Mayonaise for a medium level of heat in the overall sauce. For a mild taco sauce, reduce to 1 teaspoon of siracha (same quantity of mayo). 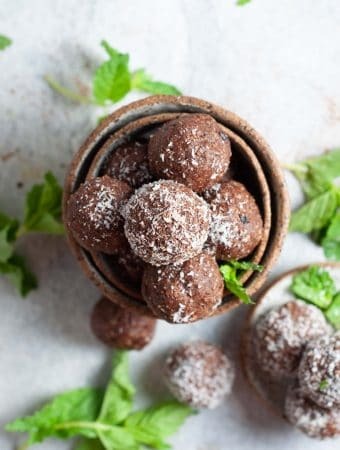 Tried this recipe?Mention @mysugarfreekitchen or tag #mysugarfreekitchen! ★ Did you make this recipe? Don’t forget to give it a star rating below! 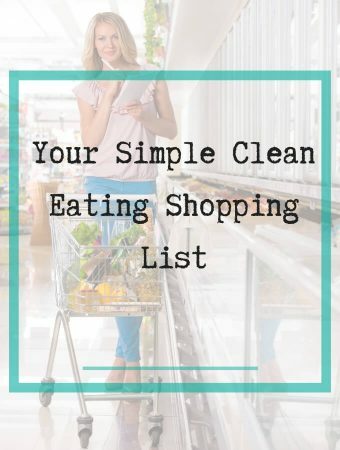 To Help You Reconnect With Food. Hi there! 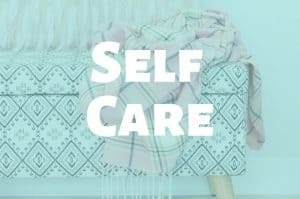 I’m Kim and I'm passionate about living a life infused with mindfulness, simplicity and self-care. 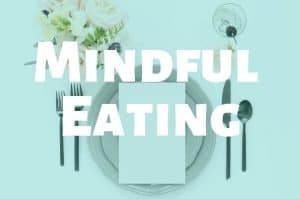 Here I share my recipes, tips, insights and wisdom for eating mindfully and living vibrantly. 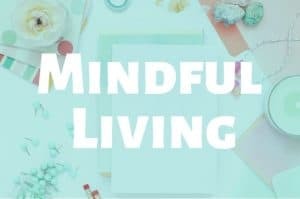 A Free 5 Day Email Mini Course to Help You Reconnect With Food. 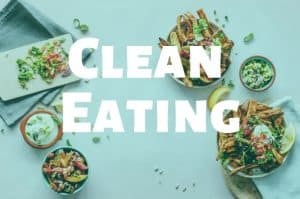 FREE: 5 Powerful Secrets To Transform Your Relationship With Food!